The Center For Family Chiropractic Care PLLC in Winona, MN provides advice on how to life healthy. The Center For Family Chiropractic Care is locally owned and operated in Winona, MN. Since we grew up in this area, our patients are our friends and neighbors, or friends we have just not met yet. 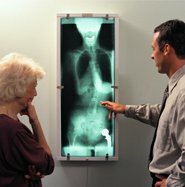 In addition to our training, we have a state of the art digital x-ray equipment, to assist us in providing a comprehensive and accurate examination. We have a comfortable and relaxed office with on and off street parking. At the first appointment we will attempt to answer any questions you have. We will perform a detailed exam. And set up a treatment plan customized to your condition. If we find that you have needs that extend beyond our chiropractic care we will refer you to the appropriate professional. Call (507) 474-1530 Now to set up an appointment.